GAUGING a STUDENT-ATHLETE’S LEVEL of RECRUITMENT In high school, Izell Reese was a negligible five pounds shy of the average Division I linebacker. His other stats were spot on. He was 6’2” with a 3.2 grade-point average and a 4.4-second 40-yard dash. On top of that, he was one hell of a great ball player, making the varsity team his freshman year. College coaches took notice of Reese. During practice his junior year, Reese’s high school coach handed him piles of recruitment letters from college coaches; each letter assured him that he would not only have a spot on a Division I football team, but also win a full athletic scholarship. Reese was certain he had a place on a college team. And in retrospect, he should have been a sure thing. After all, he would go on to play for the Dallas Cowboys, Denver Broncos, and Buffalo Bills for seven years. But Signing Day came and went, and Reese, who was later an NFL draft pick, was not offered a spot. Compare Reese with Heather Geck. Her junior year in high school, Geck’s eighteen-hole golf average was 106.4, way too many strokes for even the Division III average golfer. Her grade-point average was 2.2. But Geck received nearly a full scholarship to a private university, a dream come true for her parents. Why the vast difference? Why was Geck, an average athlete with average grades, given nearly a full ride while top football prospects with good grades are overlooked? You might guess that football is more competitive than golf. True, but when Izell Reese walked on as a freshman at University of Alabama at Birmingham, he noticed that teammates with less ability and lower grades had been given full athletic scholarships while he, clearly a superior student and athlete, was paying out of pocket. And Reeseâ&#x20AC;&#x2122;s story is not rare. Hall of Famer Jerry Rice, a first-round draft pick, was not recruited by any Division IA programs, even though he grew up only seventy miles from the University of Alabama and, as a college athlete, would go on to set records that stood for more than twenty years. As a high school player, Walter Payton was one of the stateâ&#x20AC;&#x2122;s top running back prospects, but he too would not receive a single Division IA scholarship offer, though he also would go on to become a first-round draft pick for the Chicago Bears. Tony Eason, a first-round pick in the famous 1983 NFL Draft, was not recruited out of high school; after junior college, he was offered only one scholarship. Far too many athletes miss out on collegiate opportunities or, like Reese, Payton, and Rice, pay out of their own pockets simply because they do not know how to play the recruiting game. In every high school community in every town across the country sits an aging athlete reliving his glory days as the high school quarterback. This scenario has become a token joke in movies, but in truth, the situation is heartbreaking. Those athletes should have been awarded scholarships, but they did not know the rules. These athletes, their parents, and high school coaches operated under myths, unaware of the five things they needed to know to open the doors to college opportunities, namely: 1. When does the recruiting process begin? 2. Where do college coaches find talent? 3. How do college coaches evaluate talent? 4. Where should student-athletes find colleges? 5.	Who is responsible for what? THE FIVE THINGS YOU NEED TO KNOW #1: When does the recruiting process begin? The myth is this:	The recruiting process begins when a student-athlete is contacted by a college coach during the athlete’s junior or senior year of high school. The reality is this: Due to the rise in athletic scholarship need and the increase of available information for college coaches, the recruiting process is now started earlier than ever. According to the NCAA, college coaches are starting to identify seventh and eight graders as recruits and are even starting to offer scholarships to prospects before their freshman year. The recruiting process starts during a student’s freshman year at the latest. The NCAA requires a specific number of core courses be completed for a student to compete at NCAA colleges and universities. These core classes begin the athlete’s freshman year. Failure to meet these requirements can eliminate a student-athlete’s scholarship hopes, regardless of how talented the child might be. Every freshman student-athlete with serious hopes of playing collegiate athletics should visit www.ncaa.org and read the NCAA Guide for the College-Bound Student-Athlete. College coaches begin identifying prospects as early as seventh grade in some sports, including men’s basketball. For Division I programs in every sport, college coaches begin compiling their lists of potential recruits when student-athletes are freshmen. College coaches are able to offer scholarships to student-athletes at any point, as evidenced by the recent trend in sports such as men’s basketball, where many student-athletes commit to a college prior to their first day of high school. as student-athletes. Coaches from schools with big athletic programs will send ten to fifteen thousand letters to start the recruiting process, but they will only offer about twenty to twenty-five scholarships. For many high school athletes, receiving that first letter of inquiry from a college is the most exciting, but do not mistake an initial letter from a college as an indicator of high interest. My first five letters came from Michigan, Tennessee, Notre Dame, Arizona, and Brigham Young University, none of which made offers. Coaches and athletic directors purchase lists of high school athletes, so an athleteâ&#x20AC;&#x2122;s name is likely just one on a list. A letter means a school knows who the athlete is, and in many cases, all it means is that the school has seen the studentâ&#x20AC;&#x2122;s name in some sort of database. Remember: Mail is just the initial stage; recruitment occurs when a student and coach talk, build a relationship, meet personally, and schedule an evaluation. Do not confuse the two. The top indicators of a coachâ&#x20AC;&#x2122;s level of interest, in declining order, are: 1. Full scholarship offer in writing. 2. Full scholarship offer made verbally. 3. Partial scholarship offer in writing. 4. Partial scholarship offer made verbally. 5. Offer of an official visit. 6. Phone calls from the head coach on the first day of the contact period, which varies by sport. 7. Hand-written weekly letter from head coach or assistant coach (the former indicates higher interest). 8. Athletic application with fee waiver. 9. Letter from head coach or assistant coach with an invitation to call or email (the former indicates higher interest). 10. Offer of an unofficial visit or game day visit. 11. Request for game, highlight, or skills video. 12. Invitation for pro-rated one-day summer camp visit. 13. Questionnaire and letter inviting the student-athlete to correspond or call. This list merely denotes interest. Without exception, official commitments are signed into action only on Signing Day. Unless an athlete has signed on the dotted line, no guarantees exist, no matter how many phone calls, letters, FedEx packages, or written offers the student-athlete receives. Remember that the scholarship offer is for one year only; student-athletes will need to renew their scholarships for their sophomore, junior, senior, and sometimes fifth year of college, so the recruiting process continues even after they have signed on the dotted line. « « Fa s t Fac t « « The following are not signs of recruitment: 1. Invitation to attend a camp. 2. A generic admissions letter. 3. A scout attending a game (unless the scout came to evaluate the student-athlete). coaches beating down the athleteâ&#x20AC;&#x2122;s door to help olâ&#x20AC;&#x2122; State U. win championships? Where is the pot of gold at the end of the athletic rainbowâ&#x20AC;&#x201D;the free tuition, books, room, and board? Perhaps the athlete is a superstar, but if the student-athlete does not initiate communication with coaches and convey an interest in competing in a program, the student will have a hard time finding a home at a college. The student-athlete must be prepared to call coaches, ask the right questions, and take the initiative. As well, remember that college coaches purchase verified recruiting lists and rely on credible third parties to begin their process of finding talent. These trusted sources save the college coach an enormous amount of time, effort, and money by providing the college coach only with potential student-athletes they might be interested in. College coaches rarely discover talent at events such as camps, combines, and showcases. (In fact, NCAA rules prohibit college coaches from attending combines.) Coaches attend most events with a list of student-athletes who they are already recruiting. If a student-athlete is not on the list, chances are that the athlete will not be on the list after attending a camp, combine, or showcase. The average college coach recruits from multiple lists. Student-athletes should take advantage of all credible opportunities to get their name on as many of these lists as possible. #3: How do college coaches evaluate talent? The myth is this:	College coaches initially evaluate talent by attending high school games and watching unsolicited videos sent from students and families. The reality is this:	College coaches do a majority of their initial evaluations by looking at videos requested or received from reliable sources and delivered online or digitally. After watching a video, a coach may decide to make an in-person evaluation. well into the darkness. All those weekends on the road and dinners at the drive-thru window. All those lost holidays and summer vacations spent at sporting events. Don’t forget all those checks written to support their mighty endeavors. « « Fa s t Fac t « « According to Jack Renkens, former college athletic director at Division II school Assumption College, former college coach, and parent of a recruited student-athlete, parents can expect to spend on average $15,200 on their child’s athletic career after paying for shoes, uniforms, equipment, camps, clubs, traveling, and medical expenses. •	Division III is the largest division, with over 450 colleges and universities. •	Overall, Division III schools also have the highest level of academic programs. •	The biggest grants-in-aid packages are available at the Division III level. •	The Division III level of play is more realistic for most student-athletes. In other words, a student-athlete will likely be awarded more money to receive a better academic education while seeing more playing time at a Division III school. « « Fa s t Fac t « « The top of the top athletes can receive fifty offers by January 1 of their junior year. Most major Division I prospects will receive offers by the end of their junior year. out on potential scholarship money because they are unrealistic about their lot in the athletic world, and they believe they are being more heavily recruited than they really are. They sit by the phone or mailbox waiting to hear from coaches that are not going to call. Often, these athletes will ignore overtures from Division II, III, and NAIA programs because they are certain they should be playing Division I athletics. Never mind that the education they would receive could be just as good, if not superior, at a smaller school, and that they could receive more playing time, making for a rewarding experience. Trouble is, by the time many of these athletes realize that the Division I scholarship is not coming, they are too late for a Division II or III school. Take football, for example. Though the annual Signing Day is in early February, many commitments are made before the beginning of the athlete’s senior year. Any player who has not received a verbal offer by Christmas likely is not getting one. Once those Division I verbal commitments are made, the cards begin to fall, as athletes who have not been offered Division I scholarships are scooped up immediately by Division II and III programs. Student-athletes should not blow it by sitting around waiting for coaches to plead for them to come. Athletes should do their homework early and often, and not let ego get in the way of a fulfilling college experience. « « Fa s t Fac t « « Many of the best packages come from “non-scholarship” Division III programs. The reality is that if a Division III program wants an athlete, the school often finds a need- or non-need-based scholarship that applies to the student. In other words, Division III schools give financial aid based on how much they need a student-athlete. The key is to have multiple opportunities to negotiate the best bottom line. #5: Who is responsible for what? The myth is this:	A student-athlete’s high school or club coach is responsible for getting the athlete a scholarship. The reality is this: The average high school coach has contact with fewer than five college coaches, most of whom are local. Student-athletes and families are ultimately responsible for connecting with college coaches. The harsh reality is this: High school and club coaches most often cannot secure scholarships for student-athletes. The average high school coach knows no more than five college coaches. Fewer still have a personal relationship with college coaches, most of whom are local, though more than 99 percent of the opportunities for athletes will be from outside their geographic location. Even if a student’s coach is highly connected, the coach will likely have other student-athletes to help. High school coaches usually have neither the time nor the resources to commit enough energy necessary for an athlete to be recruited. Most high school coaches are not required to facilitate the recruiting process, and their budgets do not cover the expenses related to recruiting. The responsibility rests squarely on the shoulders of the student-athlete and parents. If a student-athlete’s high school coach tells an athlete otherwise, the athlete should express gratitude and accept any offers for help, but the athlete should not rely solely on the coach when it comes to a scholarship future. An athlete should provide her coach with all the information necessary to help her earn a spot on a college team and continue her own aggressive search. Even Frank Lenti, named Illinois Coach of the Century and the 1998 Nike USA High School Coach of the Year, agreed that a high school coach most often cannot negotiate a scholarship for a student-athlete. The student and the student’s family must work proactively, consulting the high school coach about the realistic level of recruitment, but taking the reins themselves. Incidentally, Frank Lenti, averaging seventeen players a year who go on to play football in college, is legendary. In the twenty-four years he has been head coach of Chicago’s Mount Caramel High School football team, the team has been to the state championships thirteen times and won nine state crowns. Consider also that high school coaches are most often physical education teachers. If student-athletes have aspirations that fall outside the purview of physical education, they should get help from educators in more related professions to find the correct fit for college. Coach’s Tip “Families needs to take responsibility for their own youngsters,” said Coach Lenti. coach from Mount Caramel High School, said parents almost always think their athletes can play at least one level above their actual ability. Survey one hundred college coaches, and they will all tell you the same thing: Most students who come knocking are simply unqualified to play at that level. The same goes for parents. Part of a parent’s job is to be a child’s number one fan. Though this is the trademark of a good parent, it is not conducive to making an objective evaluation of a child’s potential, especially when parents likely have little, if any, access to information about overseas and nationwide competitors. Gauging an athlete’s abilities accurately might be difficult for parents and athletes, but it is also critical. Students who believe they play at a Division I level might overlook opportunities from Division II or III schools that offer more realistic opportunities. Having an accurate gauge of an athlete’s level of ability early in high school helps manage expectations and set goals. A freshman athlete playing at a Division III level in high school might very well set goals and become a Division I-level athlete by the senior year, but without a barometer advising what those goals should be, the athlete might fail to meet the recruitment requirements. 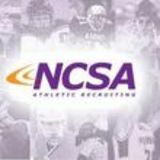 « « Fa s t Fac t « « Some recruiting and scouting services, like the NCSA, provide objective third-party evaluations that assess a high school student-athlete’s ability to play at the collegiate level. For more information, visit www.athleteswanted.org. 6’3” 6’3” Four-time varsity Three-time varsity letter-winner in letter-winner in high school high school For a full listing by sport and position, see www.athleteswanted.org. athletes often have little time to volunteer for the community or participate in extracurricular activities, students who promise to bring a bevy of talents to a school will be more easily recruited than adequate students with few highlights on their college application. The stronger the athlete is in athletics and academics, the less important other extracurricular activities will be. GAUGING THE ATHLETE’S LEVEL OF RECRUITMENT Keep this in mind: Having all the right stuff and doing the right stuff are not the same things. An athlete might meet or exceed all Division I criteria and still fall into the category of lightly or not-at-all recruited because the student did not play the game of recruitment properly. A student-athlete’s level of recruitment falls into one of five categories: 1. Elite recruitment 2. Serious recruitment 3. Moderate recruitment 4. Light recruitment 5. 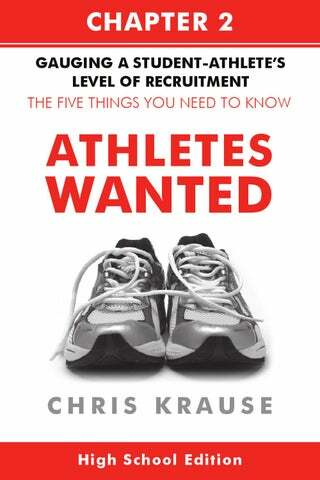 No recruitment Elite Recruitment If an athlete is a superstar athlete who knows how to play the game of recruitment, especially in the marquee sports of football and basketball, the athlete likely would already have offers. Coaches will start sending letters of inquiry as early as an athlete’s seventh or eighth grade year, using every strategy within the rules—and some outside the rules—to sign an athlete on Signing Day. Even in the so-called Olympic, or non-revenue sports, such as lacrosse, soccer, swimming, and wrestling, the elite athletes will probably not go unnoticed. At least three offers (depending on sport). At least one offer (depending on sport). At least five offers on the table. Coaches say student-athlete is the top recruit. Over sixty emails immediately following September 1. College coaches call studentathleteâ&#x20AC;&#x2122;s high school or club coach/director to inquire about the athlete. Head college coach begins to call June 15 (depending on sport). Video requests (depending on sport). Transcripts requested by college College coaches call the student- coach. athleteâ&#x20AC;&#x2122;s high school or club coach/director to inquire about Depending on sport, head the athlete. college coach begins to call after April 15. College coaches watch the College coaches watch the athlete play at club tournaments athlete play at club tournaments and showcases (depending on and showcases (depending on sport). sport). Over sixty letters/emails from different schools. Letters/ emails include camp brochures, questionnaires, information about NCAA rules, and invite the student-athlete to call or email the coach. More than thirty letters/emails from different schools. Letters/ emails include camp brochures, questionnaires, information about NCAA rules, and invite the student-athlete to call or email the coach. Fifty plus phone calls from different schools. At least ten official visit invites. Ten or more offers on the table. Three or more in home visits. Student-athlete receives personal phone calls from college coaches immediately following July 1 (Division I) or June 15 (Division II). See NCAA recruiting guidelines for sportspecific call dates. At least one offer (depending on sport). College coaches call studentathlete’s high school or club coach/director to inquire about the athlete. College coaches call studentathlete’s high school or club College coaches watch the coach/director to inquire about athlete play at club tournaments the athlete. and showcases (depending on sport). College coaches watch the athlete play at club tournaments and showcases (depending on sport). Over thirty letters/emails from different schools. Letters/ emails include camp brochures, questionnaires, information about NCAA rules, and invite the student-athlete to call or email the coach. Depending on sport, head coach begins to call after April 15. Transcripts requested by college coach. At least three offers are on the table. Coaches extend personal invitations for student-athlete to attend camps. Coaches invite student-athlete to games. Coaches say the student-athlete is in the top five recruits. Over forty-five emails immediately following September 1. Over fifteen letters/emails from different schools. Letters/ emails include camp brochures, questionnaires, information about NCAA rules, and invite the student-athlete to call or email the coach. At least thirty phone calls from different schools. At least five official visit invites. At least five offers on the table. At least one in-home visit. College coaches may watch the athlete play at club tournaments and showcases (depending on sport). Fewer than fifteen letters/emails from different schools. Letters/ emails include camp brochures, questionnaires, and information about NCAA rules. Unofficial visit invites. Emails from coaches in the fall. Might be personalized. Assistant college coaches begin to call June 15 (depending on sport). Depending on sport, assistant college coaches begin to call after April 15. Coaches call student-athlete’s high school or club coach/ director. Coaches invite student-athlete College coaches may watch the to games. athlete play at club tournaments and showcases (depending on Coaches evaluate studentsport). athlete’s team in person. Fewer than thirty letters/emails from different schools. Letters/ emails include camp brochures, questionnaires, and information about NCAA rules. Possibly one to three offers. Coaches tell the student-athlete to apply. Ten or more college coaches call in July. Under five official visit invites. Fewer than ten letters/emails from different schools. Letters/ emails include camp brochures, questionnaires, and information about NCAA rules. School will send 1-800 number and the school’s media guide. Fewer than fifteen letters/emails Form emails from coaches. from different schools. Letters/ emails include camp brochures, Coaches invite student-athlete questionnaires, and information to games. about NCAA rules. Coaches evaluate studentAssistant college coaches begin athlete’s team in person. to call June 15 (depending on sport). Coaches may call studentathlete’s high school or club coach/director. Student receives a few emails/ phone calls from coaches. Coaches act as if student is going to apply. Coaches invite student to walk on. No more than ten college coaches call beginning in July. No more than three official visit invites. Athletes receive fewer than ten questionnaires. Athlete receives camp brochures Athlete receives camp brochures Athletes receive no more than and general admissions informa- and general admissions informa- ten form emails. tion only. tion only. Athletes continue to receive camp brochures. Athletes continue to receive camp brochures. Athletes receive no more than ten form emails. Surprisingly, even those students who receive one hundred letters of interest do not fall into the category of elite recruitment. Unless a ton of offers are on the table, assume that an athlete needs to proactively market himself and search for a college. Even student-athletes in the “heavily recruited” category will not likely have their top choice of a college. To some extent, whether a student is noticed can be a crapshoot. The size of the high school can make a difference. The location can make a difference. The high school’s media exposure can make a difference. College coaching staffs do have limited budgets even at the highest levels, and programs are restricted by NCAA guidelines from engaging in certain recruitment activities. But if student-athletes play the game right, even if they are average athletes or students, they can still leverage outstanding opportunities. The athlete or her parents should also complete the Recruiting Action Plan questionnaire at www.athleteswanted.org, which will provide an evaluation of where the student-athlete stands, as well as a sport-specific action plan based on the athlete’s grade level, ability, and level of recruitment. Far too many athletes miss out on college opportunities because they do not know how to play the recruiting game. In fact, the best athletes are often not offered scholarships, while far less superior athletes receive glamorous offers. Athletes, parents, and high school and club coaches should know five things to protect the athletes from falling through the cracks: #1: When does the recruiting process begin? The myth is this:	The recruiting process begins when a studentathlete is contacted by a college coach during the athleteâ&#x20AC;&#x2122;s junior or senior year of high school. The reality is this:	Due to the rise in athletic scholarship need and the increase of available information for college coaches, the recruiting process is now started earlier than ever. According to the NCAA, college coaches are starting to identify seventh and eight graders as recruits and are even starting to offer scholarships to prospects before their freshman year. #2: Where do college coaches find talent? The myth is this:	College coaches discover talent their junior or senior year by attending camps, combines, showcases, tournaments, and high school games. The reality is this:	College coaches depend on verified information from reliable sources, and they purchase lists of prospects as young as seventh grade. Most coaches attend tournaments, games, and camps with lists of student-athletes they intend to evaluate, not with hopes of discovering random prospects. #3: How do college coaches evaluate talent? The myth is this:	College coaches initially evaluate talent by attending high school games and watching unsolicited videos sent from students and families. The reality is this:	College coaches do a majority of their initial evaluations by looking at videos requested or received from reliable sources and delivered online or digitally. After watching a video, a coach may decide to make an in-person evaluation. #4: Where should student-athletes find colleges? The myth is this:	NCAA Division I is the only option for collegiate athletic scholarships. The reality is this:	Over eighteen hundred colleges and universities sponsor collegiate athletes and are able to offer financial packages. Most opportunities fall outside of Division I programs. #5: Who is responsible for what? The myth is this:	A student-athleteâ&#x20AC;&#x2122;s high school or club coach is responsible for getting the athlete a scholarship. The reality is this:	The average high school coach has contact with fewer than five college coaches, most of whom are local. Student-athletes and families are ultimately responsible for connecting with college coaches. 2. Having an accurate assessment of ability helps a student-athlete determine which schools might be a good fit. Athletes can start by learning the recruitment requirements for their specific sport (see www. athleteswanted.org). The student-athlete can ask college coaches for an evaluation of all potential opportunities and ask college coaches what their specific athletic requirements are. Athletes should consider their grades and set goals accordingly. 3. In addition to ability, athletes should know their level of recruitment and take the Recruiting Action Plan questionnaire, available at www. athleteswanted.org, for a sport-specific action plan based on grade level, ability, and level of recruitment.